During a Holy Thursday ritual, Pope Francis continued to break the traditions at the Vatican. 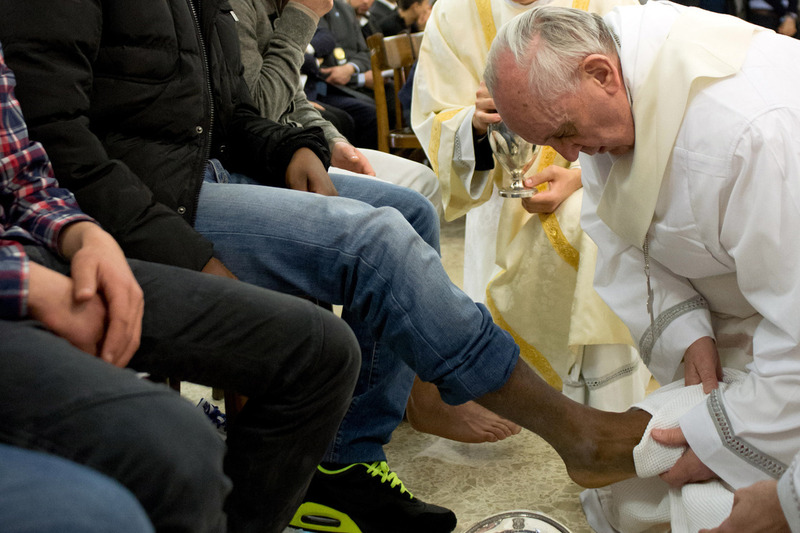 Pope Francis washed and kissed the feet of 12 young people at a youth prison. Among them were two women and two Muslims. The act was a break with tradition. As The Guardian reports, all modern popes have partaken in the ritual by washing the feet of fellow priests at either St Peter’s or the Basilica of St John in Lateran. “While the former Cardinal Jorge Bergoglio included women in the rite when he was archbishop of Buenos Aires, it was the first time women had taken part in a papal Holy Thursday ceremony. The tradition is supposed to replicate a biblical story in which Jesus Christ demonstrates humility by washing the feet of the 12 apostles on the night before he was crucified. During a short homily before the ritual, the pope urged priests to go out into the world. ” ‘It almost feels like the Vatican found itself a very good marketing and communication adviser,’ said Valeria Angela Montis, a 38-year-old Roman.